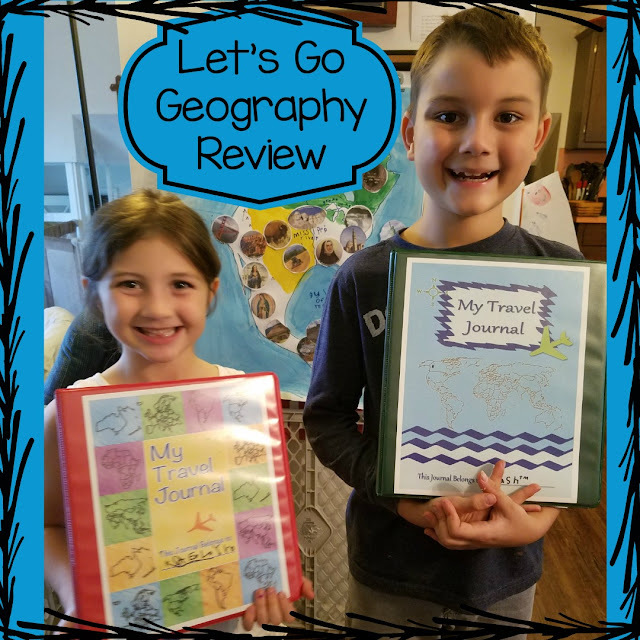 We've been having so much fun with this weekly homeschool geography curriculum from Let’s Go Geography. Let's Go Geography is a kindergarten through fourth grade online geography course. Each week, an email is sent to you to remind you to go online and work on the next lesson and each lesson is a new country! Each lesson is stand-alone and so you could jump around without having any problems because the lessons do not build on each other. Each lesson has different activities, and although each lesson follows a basic format, the activities vary from lesson to lesson. Each lesson gives you library call numbers to check out books from the library. You also listen to music, color the map and flag, and there is some sort of craft project to do along with the lesson. Most important, is that there is a supply list at the beginning of each lesson. To be honest, this is exactly the kind of geography I like to do with my kids, but without the work of me finding everything and piecing it together myself. It saves me time and reduces stress, and that makes everyone happier. My kids are in second and fifth grade, and even though my oldest was a *little* old for the lessons, he still learned quite a bit. This was a great supplement for him and a complete curriculum for my daughter in second grade. My kids made travel journals so when I printed out items for them, we three-hole-punched the papers and kept it all together in the binder. It was a fun way to look through everything as we progressed through the lessons. There is also a kid's passport you can print out to go along with your lessons. That was a cute little extra that made it like a game for the kids. We worked on the lesson together one day a week. I would print out everything I needed before the lesson and then together we would use the computer to work on the country. I would let my son decide what he wanted to do and he normally opted out of coloring pages and crafts because he is "too cool" these days. My daughter loved the coloring pages and especially the crafts. We happened to be studying Hawaii when my parents were in Hawaii sending home postcards about their trip. That was a fun way to connect real life with school, which always makes it more fun. The lei craft with Hawaii was the only craft Sebastian participated in, which surprised me. It think it was because of the connection to his grandparents. We ended up spending two weeks on Hawaii because the kids enjoyed that lesson so much. We also enjoyed going to countries very different from ours like Haiti, Belize, and Chile. The rainstick craft in Chile was one of *my* favorite crafts! This is the three year curriculum plan laid out. I reviewed year one and we got through most of the first quarter. You could easily go on a tangent and spend longer than a week on each lesson. Let's Go Geography is great for any homeschool family that forgets about geography, doesn't have time to fit it in, and wants something easy and planned out for them. It is also great for those that need to cut out a little stress in their life and let someone else do the planning for the subject. To see more reviews of Let's Go Geography, please click on the graphic below.